Julie Pecora is sitting in the greenhouse at Angora Gardens with temperatures inside hitting a balmy 80 degrees. It’s just one area of the nearly three-acre property used to help clients and the public. With the sound of the fans pulling cool air through the windows to keep the plants happy, she explains what she hopes anyone who interacts with this place receives. Angora Gardens is a community wellness center, primarily working with people with disabilities, but it also serves the public in many ways, offering free health and wellness classes including yoga, aroma therapy, horticulture therapy, arts and crafts and more. It’s also a popular rental space for weddings, meetings, birthday parties and other events. The White Oak facility is run by Mon Yough Community Services, a subsidiary of UPMC. 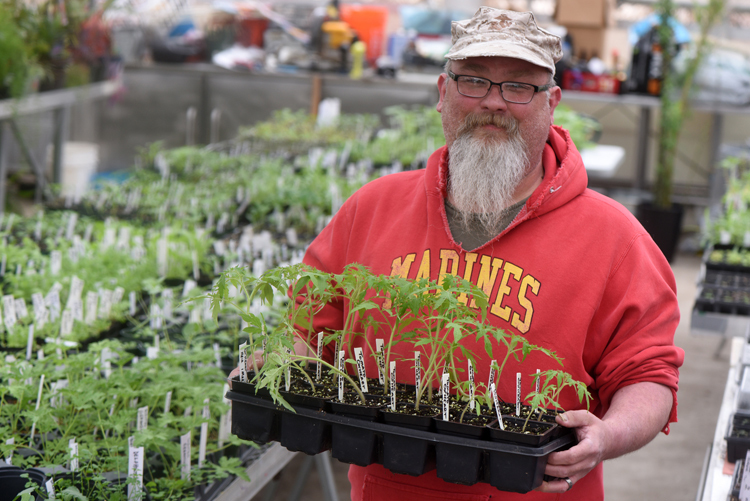 As supervisor of Angora Gardens, Pecora has seen first-hand the therapeutic power clients and the community feel when getting their hands dirty working in the greenhouse. “It all goes back (to) the whole purpose is to be here for what people need,” she adds. Angora Gardens is funded completely by grants. “We can’t survive without grants, donations, community involvement and volunteerism,” Pecora says. It’s not only visitors who are touched by this place, as there’s something the staff receives, too. The office is in a beautiful old farmhouse surrounded by stunning outdoor gardens filled with perennials and annuals during the season. Pecora came here to run the operation two years ago, after working in a windowless office for years. Two weeks into her new job, she gazed out of one of the three windows in her office as the winter weather turned. A flat of ‘Chocolate Stripes’ tomatoes grows in the greenhouse at Angora Gardens in White Oak. The plants will be available on May 12 from 10 a.m. until 2 p.m. at the Angora Gardens’ Plant Sale. Program and property coordinator Robert Stone agrees. He worked here for eight years, left for what he thought were greener pastures and longed to return, which he was able to do a couple of years ago. The clients he spends time with have intellectual disabilities, so he uses the greenhouse as a therapeutic respite for them. Together they have filled the greenhouse with more than 100 flats of unique vegetables, annuals, perennial flowers and herbs that will be used in the gardens here, but also sold as a fundraiser for the site at a plant sale from 10 a.m. to 2 p.m. on May 12. They’ve got things that will be hard to find anywhere else. For tomato lovers looking for something unique, Stone and the clients have planted ‘Chocolate Stripes,’ ‘Pineapple,’ ‘Black Krim,’ ‘Oxheart,’ ‘Red Currant,’ white tomatoes and an interesting one called ‘Atomic Grape’ from Baker Creek Heirloom Seeds. It produces elongated, large cherry tomatoes in clusters that have lavender and purple stripes and ripen olive-green, red and brownish blue. The colorful tomato is very sweet and crack resistant. They will range from the size of a large grape tomato to a small plum. Another interesting thing he has in the greenhouse are volunteer tomatoes. Varieties that didn’t get labeled will provide a fun surprise in the garden. There are a wide variety of peppers, too, including anchos, ‘Candlelight’, sweet peppers, hot wax and one called ‘Five Color Chinese Pepper.’ They are very hot little peppers which turn a rainbow of colors — from purple, cream, yellow, orange and red — as they ripen. It’s an ornamental edible that’s a great container plant, too. Perennials include columbine, several different milkweeds, bee balm, hollyhocks and many more. A lot of what’s planted here are pollinator friendly. There are a host of other fascinating plants sowed by Stone and the clients. 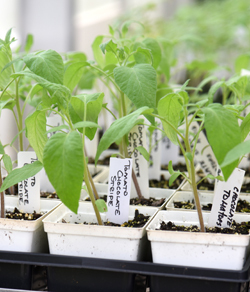 They are growing strong in the greenhouse and will hit the ground running when planted. 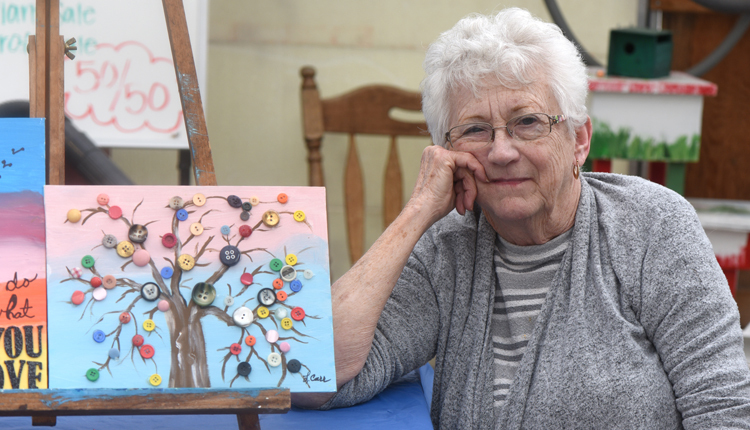 Loretta Carr is a talented aretist who teaches various art classes at Angora Gardens in White Oak. Loretta Carr has spent decades in different capacities at Angora Gardens; at one time she was the gardener here. She’s always had a green thumb and enjoys what the plants can do for visitors and staff. “It’s bringing life to us and the people outside of Angora Gardens,” she says. The talented artist teaches clients and the public many different ways to create art. The clients hold a special place in her heart and work to provide hope for all of them. Details: For more information about Angora Gardens and the May 12 Plant Sale go to angoragardens.org.